I have singlehanded my boat from Santa Cruz California to La Paz Mexico. I am looking for a hand (possibly two) for the crossing to the Marquessas and possibly beyond. I am young (26) adventerous, active, and open minded. I would love to find some cool folks who are at a similar place in their lives to share the adventure. 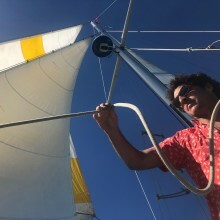 Sailing knowledge is a plus but not necessary. Boat descriptionMidnight Rider is a very sturdy 28 foot (on deck) Liberty 28. Her design is very similar to a Wetsail 32. She loves heavy following seas and their is an Aries Windvane for self steering. I have GPS, Satellite Phone, Radar, Survival Suits etc.